Stellar Phoenix Data Recovery for iPhone Mac is an easy to use data recovery tool that enables you to recover lost and deleted data from iPhone 7, 6, 5 and 4 variants. The program comes with a practical and modern layout that provides its main features as modules so you can easily recover data from your iPhone’s storage but also from iCloud and iTunes backups. There are two main options – Scan Backup and Scan Device – displayed in the main window. Scan Device enables you to recover data from your iPhone’s storage. 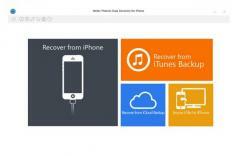 To recover data from an iCloud or iTunes backup use the Scan Backup option. You can recover all kinds of lost data, such as photos, messages and attachments, notes, contact information, and calendar entries but also messages and files from third-party apps. The software supports Mac OS X 10.8 and higher versions.